For great deals on Sofa Sales, visit your nearest My Rooms Furniture Gallery furniture store location or browse our featured sofas below. We offer a variety of sofas and couches in different sizes and styles. Choose a reclining leather sofa, or a contemporary low-profile sofa. We offer high-leg styles and overstuffed options. No matter your style preference, we have the perfect sofa for you! With an exciting Metro Modern flair that is sure to brighten the look of any living area, the Kylee-Lagoon upholstery collection features flowing curved arms along with comfortable seating & pillow back cushions surrounded with bright upholstery that perfectly captures a light airy atmosphere. The coastal style Kylee Lagoon Sofa is ideal for those who want to freshen up their living rooms. With a refined contemporary design that perfectly utilizes both style and comfort, the Levon-Charcoal upholstery collection features plush boxed T seat cushions along with shaped set-back arms and a scatter back pillow design to beautifully enhance the decor of any living area. Everything about the traditional Cambridge Sofa is substantial: oversized rolled arms, deep seat cushion, chunky nailhead trim, and more than 500 custom fabric and finish options. The Greenwich Sofa has smaller-scaled sock arms, a tightly tailored back, & tapered legs. Change the look with custom fabrics & finishes to create the perfect upholstered sofa for your home. A classic contemporary sofa for modern decorating, Layla has a tailored back, sock arms, and a wood rail and base available in multiple finishes. Hundreds of custom fabric options make it yours. My Rooms Furniture Gallery features the Parker - a traditional English style sofa that's always in style. The Parker Sofa's inviting look, English arms, turned legs, and welted trim are classic details. Shown in dark red, but offered with custom fabrics and finishes to make it your own. Pair with the coordinating club chair, ottoman, or sleeper sofa version. The traditional Travis Sofa by Broyhill has an updated two-over-two seating design, curvy rolled arms, nailhead trim, and unskirted base. Hundreds of fabric options give you the perfect look for your home. Contemporary sofa in light charcoal with bronzed embellishments along each arm rest and dark charcoal legs. Corduroy Sofa by Broyhill Furniture. The Zachary Sofa fits your style thanks to traditional details, tailored cushions and sock arms, and your choice of custom fabrics (shown in Chocolate) and finishing touches. Contemporary two-seater sofa with dark charcoal pillows and accent print with wide set cushions. Taupe colored sofa with accent pillows, thick seat and back cushions, and comfortable, durable fabric. From the Urban Elements collection, this stylish sofa by Craftmaster features a classic design with a contemporary flare. The Ethan Leather Sofa by Lane Home Furnishings offers a distinguished look with a contemporary flare. The Three-over-three frame has straight-line track arms. Visit My Rooms Furniture Gallery's furniture stores to purchase this beautifully crafted Lane Home Furnishings Stanton Sofa. The Catnapper Belmont sofa features luxurious textured diamond motif chenille fabric and is ideally suited for any large family room. The traditional design offers deep seating comfort. This collection comes with 5 versatile two-toned decorative fringed pillows & solid wood accent legs. The cushions are reversible. This large Braddock Sofa is shown in the "espresso" cover, but is available in "mineral" and "metal"
Visit your nearest My Rooms Furnitrue Gallery showroom location to purchase this comfortable leather sofa by Catnapper Furniture. 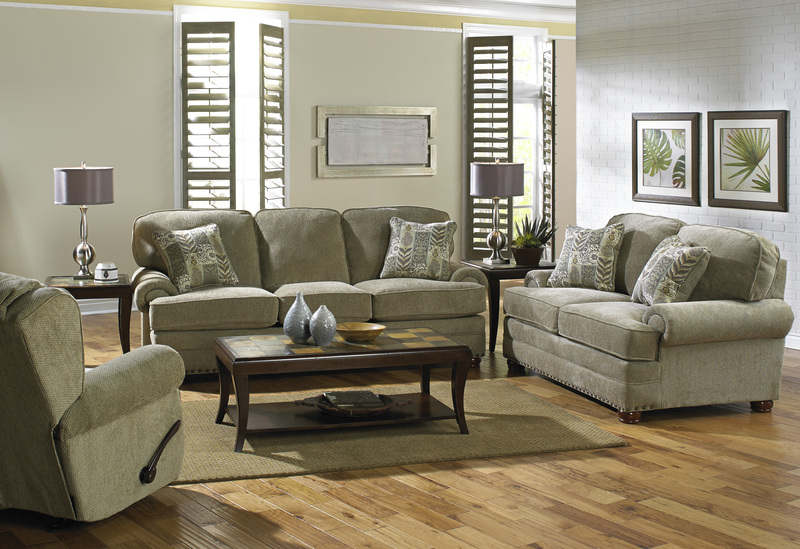 The Brantley Sofa offers supurb comfort and masculine styling. This is the ideal couch for any living room, family room, or home office. The Duck Dynasty Appalachian Reclining Sofa by Catnapper will allow users to recline to a completely flat position! Take a break from your hunting trip and rest (or nap) fully-reclined in this comfortable reclining sofa. Furnish your hunting lodge, clubhouse, or mancave with camo furniture from My Rooms Furniture Gallery! My Rooms Furniture Gallery offers great deals on Duck Dynasty camo furniture sales through our online furniture store & in our showrooms throughout the Southeast. Choose from today's top camo patterns. The Grant Sofa by Catnapper features a casual contemporary styling with deep comfort, luggage stitching, wooden pyramid legs with a merlot finish, padded bonded leather, & comfort coil seating with comfor-gel. The Grant sofa is available at My Rooms Furniture Gallery's online furniture store & in our showrooms across the Southeast! Also available in color "DOE"
This extra-wide sofa by Catnapper features designer luggage stitching, an extra wide seating area & tall back for maximum comfort, and a heavy weight-durable Valentino bonded leather touch. This small sofa only measures 76" wide and is perfect for any condo, apartment, studio, or a small room. Visit My Rooms Furniture Gallery's showrooms in Augusta, Savannah, Charleston, or Columbia to purchase this American Made sofa by BAUHAUS furniture. Curved taupe sofa with three seat cushions and comfortable padded seat back with durable, easy to clean fabric. This petite leather sofa by England Furniture offers loads of charm, rolled panel arms, a camel back design, a curved front rail, and dark turned wooden legs.